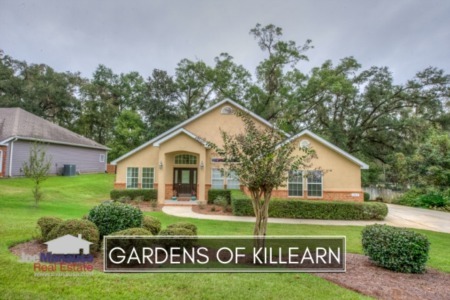 The Gardens of Killearn is a popular Northeast Tallahassee neighborhood located within and serving as the Southeastern boundary of Killearn Estates. The Gardens is a highly desirable location, where homebuyers often seek the school system and access to town. Most homes here were constructed in the 1990s, but newer ones can be found as well. 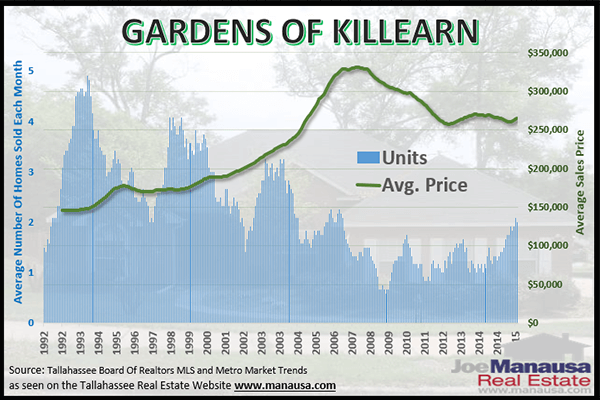 In this report, we will look at long term average home price trends, value trends, and size trends of homes sold in the Gardens of Killearn, as well as all current listings in the Tallahassee MLS and all closed home sales going back to 1991. It is important to note that the narrative contained below is for sales through December for all previous years, but through July in 2015. The graphs and the closed sales table will be continuously updated into the future (meaning bookmark this page if you always want to know the current status of homes in the Gardens of Killearn). Average home prices have been recovering since our last report in 2015. Average home prices in the Gardens of Killearn are now 5% higher than they were a year ago (December 2014). The average recorded existing home sales price was $275,800 for the Gardens of Killearn in 2015. Home sales activity moved higher, and the rate of sales is consistent with what was reported at the end of the boom market in 2006. Sellers who market and price their homes correctly sell fast in the Gardens. 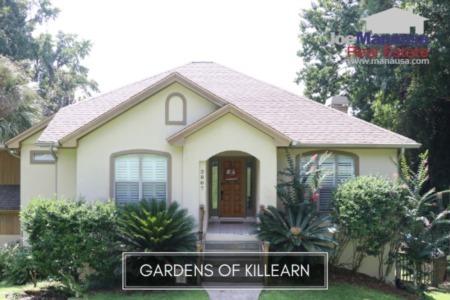 There were 24 closed home sales in the Gardens of Killearn in 2015. Average home values in the Gardens of Killearn rose nearly 3% in 2015 when compared to 2014. With relatively few sales compared to the larger neighborhoods that we measure, it is not uncommon for smaller locations to have some volatility in the numbers. 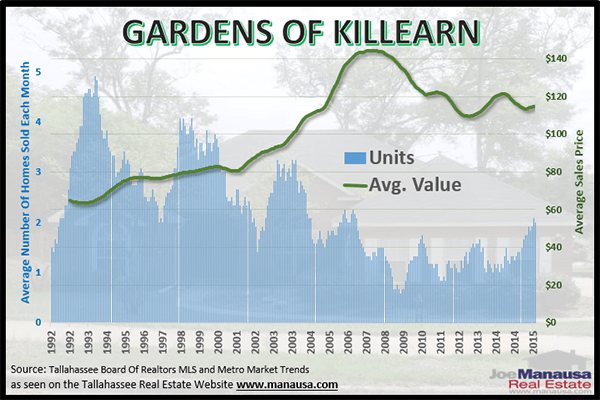 The average value of a home sold in the Gardens of Killearn in 2015 has been $117 per square foot. This is up 15% over the bottom reached in 2011, and up more than 2% since our report three months ago. Though values are appreciating again, they are unfortunately worth about a quarter less than they were in 2006, meaning many homeowners are still upside-down on their mortgages. The average home size sold in the Gardens of Killearn typically falls in a range of 2,100 to 2,400 square feet, but this year buyers have been selecting homes near the top of this range. The 24 homes sold in 2015 averaged 2,379 square feet. 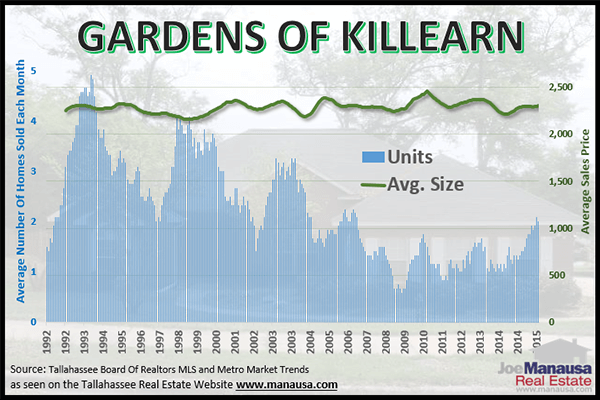 The following list shows home sales in the Gardens of Killearn since 1991. I hope you enjoyed our January 2016 update on home sales in the Gardens of Killearn, please feel free to drop me a note if you have questions not covered in this report.